Home » Blog » New Fujis for Sale in the Shop! New Fujis for Sale in the Shop! 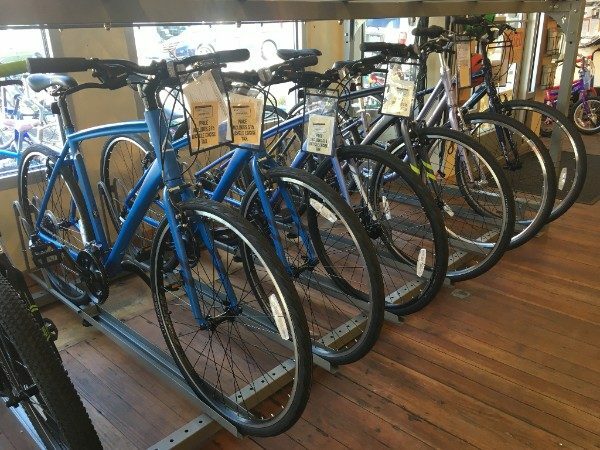 After much consideration and deliberation, the shop management settled on the idea of stocking new bicycles, and after careful vetting, zeroed in on Fuji brand bikes. These Fujis allow the shop to deliver an affordable new commuter bike throughout the year. The bikes, which come with either a traditional horizontal top tube, or a sloped “step-thru” frame, feature butted aluminum that provides the strength of a steel-framed bike with the lightweight feel of the aluminum. The components will stand up to almost anything a Portland bike commuter could throw at it and will allow the shop to offer the same 90 day warranty we’ve long offered on our refurbished used bikes. These bikes have been huge hit and sales have far surpassed internal expectation. At present, we offer four different models starting at $394 for the Fuji Crosstown, which has a 1×7 drivetrain and rim brakes. On the higher end, we’re offering the Fuji Absolute which features a 24 speed drivetrain and disc brakes. We may be bringing in even more models in the future. So next time you’re near Alberta, come take a closer look at the Fuijs! And don’t worry, our used bike selection is still one of Portland’s best in terms of price, size, and selection!